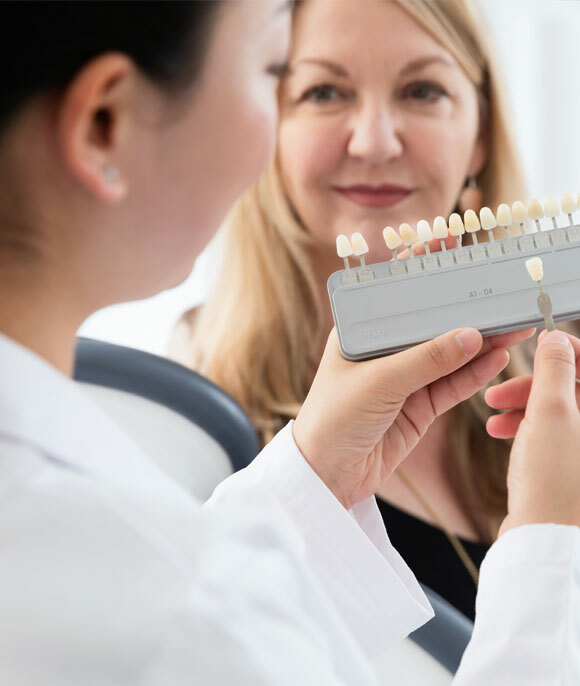 Dental veneers are another standard treatment in cosmetic dentistry, providing treatment of gaps and chipped teeth by bonding thin semi-translucent “shells” over your existing teeth. As the dentist prepares the tooth, they are required to buff the outer layer of your tooth (enamel) to allow the veneer some thickness to adhere to the tooth’s surface. Occasionally, a local anesthetic may be administered to ensure a pain-free treatment. There are two types of veneers available -porcelain and composite resin. 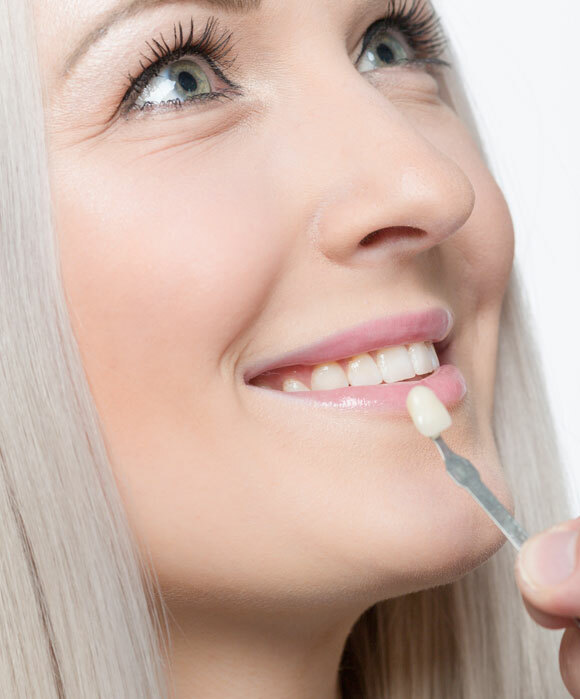 Porcelain veneers are designed to be bonded to the front of your teeth, each individual veneer is custom-made to each particular tooth to achieve a perfect natural smile. Porcelain veneers are a more expensive option and with proper care can last as long as 20 years. They are stain resistant and matched to your natural tooth colour to achieve a natural look and smile. As porcelain veneers are custom made, your dentist will make an appointment prior to the treatment day to take an impression of your teeth. This will verify the ideal fit, colour, and shape of the specific tooth against the rest of your teeth. The following appointment is a pre-fitting that will check the shape and colour match of the veneer. If everything is correct, your tooth will be cleaned and dried for the veneer to be cemented into place. Composite resin veneers are applied slowly, layer after layer to eventually cover the existing tooth. The slow process makes this type of veneer more affordable, however, they do not last as long as porcelain veneers – usually a life of no longer than 8 years with regular maintenance. Composite resin veneers can be placed in a single appointment in the dental chair and are a good option for patients who have limited time to visit a dental clinic. The procedure involves applying composite resin layers and reshaping the actual tooth to be more suitably shaped, each layer is shaped and curved by our dentist to mimic the desired look. These kinds of veneers are sculpted onto the tooth and cured with light to harden. When hardened the composite resin veneer will then be buffed and polished to resemble a natural tooth. An initial consultation for a smile assessment, and a broad discussion on the options available to you. Your general health and oral health will also be inspected, any complications will be diagnosed and treated before the veneer treatment commences. A treatment plan will also be established, estimating the duration of treatment, and sketching the final desired look. The second appointment is where your dentist will file the selected tooth/teeth, take impressions of teeth and install temporary veneers. The third or fourth appointment includes having a trial of the veneer and adjusting for a snug fit. During these appointments, the shade can be changed, and the shape readjusted. The last appointment is the installation appointment. During this appointment, final adjustments are made, and permanent cementation of the veneer is applied. Depending on the type of material used on veneer, the level of difficulty and professional lab work conducted, veneers will range in price. They are charged per tooth and it is best to realign or reform early on to avoid bacterial infections which will cause further damage and costs. Thus, book an appointment early on to achieve that fuller, straighter and whiter set of teeth.